In the middle of its spring season, the University of South Dakota women’s golf team is aiming for a Summit League Championship under the strong play of sophomore Brenna Lervick and first-year Abby Dufrane. The Coyotes recently broke a school record for a 54-hole tournament at the South Dakota State Jackrabbit Classic in Primm, Nev., where they finished 7 out of 11 teams. The team scored 51 over-par. In the Jackrabbit Classic, Lervick tied for first place but lost the medalist title in a playoff. Her first place finish earned Lervick her second Summit League Golfer of the Week honor of the spring season. Lervick said how she continues to find success is simple. Along with Lervick’s strong play, Dufrane has also shined for the Coyotes. She placed second at the Lady Thunderbird Invitational in St. George, Utah, over spring break. Hovden wants to see both Lervick and Dufrane play well at the same time. Both underclassmen, Hovden said Lervick and Dufrane help push the upperclassmen to play better as well. Hovden has also seen an increase in excitement at practice, which he believes only helps the team’s goals. 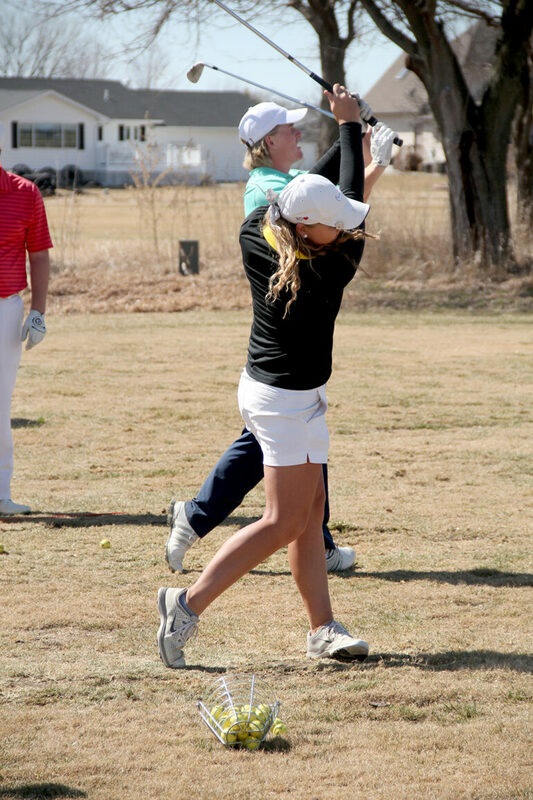 Outdoor practices have allowed the golfers to get a better feel for their play compared to hitting in the DakotaDome. The women’s team practices consist of alternating hitting balls at the range and playing on The Bluffs course with the men’s team. Hovden said it is important to keep working at the range, but getting to practice on the course is key to gaining confidence. “When you get out on the course, you relearn how to score and how to compete,” Hovden said. The Coyotes have two more tournaments before the Summit League Championship begins April 20. In order to compete for that championship, Dufrane said the focus is to find scoring depth.